RESQ Charitable Trust - Indus International School Visit: Grooming A Better Future For Us All! This month has been a flurry of activity. From rescues to recoveries, renovations and exciting new projects, it's safe to say we've had our hands full at the ResQ Centre... yet nothing makes us smile quite like one special group of visitors. ResQ has always made it a point to educate the youth of today for a better tomorrow, and last week, we had the opportunity to do just that -- except this particular group of youth also happened to be much tinier than usual. That's right, folks -- we got to spend the day with the most delightful group of kindergarteners! Primary Year students under the International Baccalaureate programme have a slightly different system of learning than some of us are used to: instead of subjects, they have modules called Units of Inquiry. Each UOI is an in-depth exploration of a concept, and this particular group of curious young minds from Indus International School came to ResQ as part of their Animal and Plant Care UOI. To say that our Outreach Manager, Jessica, was thrilled to talk to such a receptive, adorable group of kids is a colossal understatement. Just look at those smiles! As part of the educational session, Jessica spoke to the children about basic animal hygiene such as the importance of baths, nail clippings, and daily fur brushing. 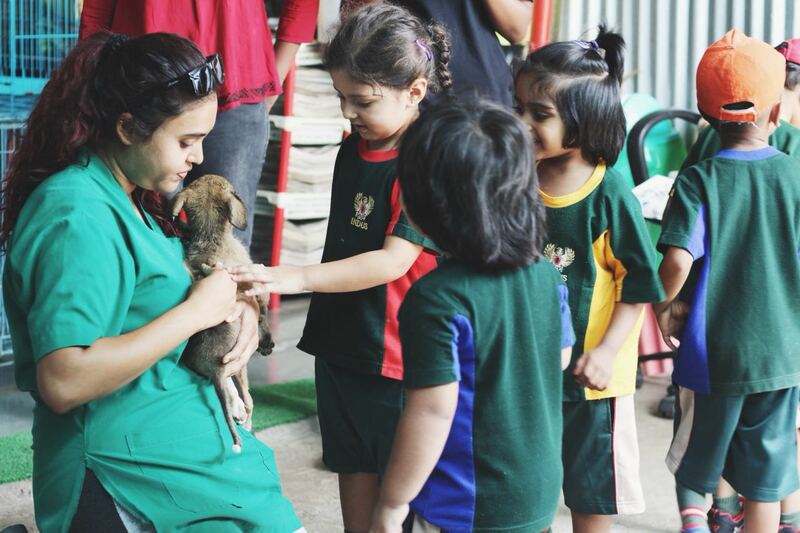 The kids were very open to learning more about animal care, and not at all scared of our friendly ResQ animals! Meanwhile, a special guest -- our very own Dr. Chetan Vanjari -- sat with the children and spoke to them about animal health and the importance of vitamins and minerals for young animals. During the session, Jessica also addressed the importance of respecting a fellow being's personal space: how not to touch, shout, or grab at animals inappropriately or disrespectfully, and how to treat them with love and care. After all, if we hope to coexist, it's important to teach our children that grabbing an animal's head, tail, or paws is not in the best interests of both child and animal. Although the kids were aged between 3-4 years old, we were astounded by their perceptive natures and inquiring young minds. Each child wanted to contribute to the conversation in their own way, to pet animals both big and small, and to learn more about each animal's unique personality. There is nothing quite as fulfilling as talking to children about the simple values of compassion and peaceful coexistence, and having them reciprocate in such a thoughtful, earnest manner. Whilst talking to the children, Jessica also highlighted the importance of feelings. "It's important to show your dog -- or any animal -- a lot of love," she explained, "because humans like to be loved, and so do animals! Apart from food and shelter, it's also very important for them to feel loved and respected." A truly fantastic message for children who will grow up to shape a better tomorrow for us all, for what else can one hope for but a world that promotes love and respect for every living being? We often emphasise our focus on human-animal coexistence, and boy, are these kids just the ones to build it. Thank you, Indus International School, for grooming a better future for us all!